Born at Meriden, Connecticut, October 18, 1907, he graduated from West Point in 1930, received an M.S. Degree from the Massachusetts Institute of Technology, 1936, was a student at Columbia University, 1945. He married Helen Amelia Bobber, October 20, 1931. He was commissioned a Second Lieutenant, Infantry, in 1930 and advanced through the grades to Colonel, 1944. He served in various Company, Battalion, Regimental assignments, 1930-44. Served as Chif of Training (G-3 Section), Headquarters, European Theater, 1944. Director, Disarmament School, London, England, 1944-45. Deputh Chief of Information and Eduation, Headquarters, European Theater, 1945. Chief Military Governor of Kyoto, Osaka prefectures, Japan, 1948-49. Deputy Chief of Civil Affairs, Japan, 1950-52. Commandant, Army Command Management School, 1954-58. He retired from the Army in 1958 and was a Member of the 86th and 87th Congresses, Connecticut At-Large; Member, Armed Services Committee, Manpower Utilization Committee, Subversive Actitivities Control Board from 1963. During his military career he received the Legion of Merit with oak leaf cluster, the Bronze Star. He was the author of many articles on military management and was the holder of patents for military items. 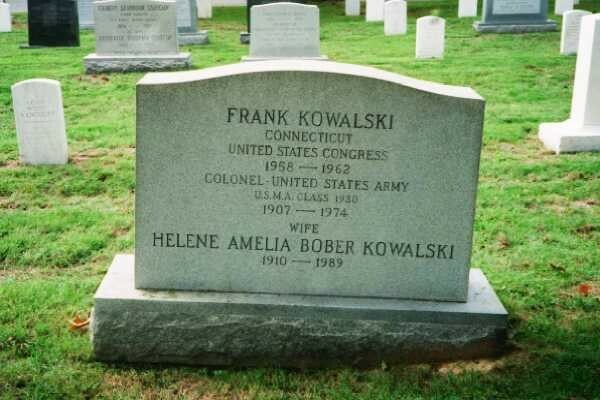 He died at Alexandria, Virginia, on October 11, 1974 and was buried in Section 11 of Arlington National Cemetery. 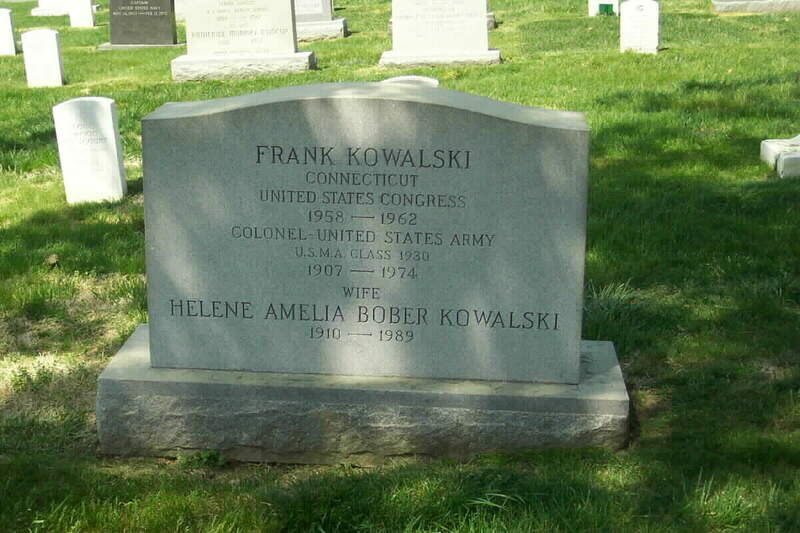 KOWALSKI, Frank, a Representative from Connecticut; born in Meriden, New Haven County, Conn., October 18, 1907; attended the grade and high schools in Meriden, Conn.; graduated from the United States Military Academy in 1930, Massachusetts Institute of Technology in 1937, and studied international relations at Columbia University in 1945 and 1946; in 1925 joined the United States Army as an enlisted man and served continuously 1925-1958, with service in the European Theater; director of program for the disarmament of Germany in 1944; helped the Japanese cabinet organize its defenses as acting chief of the American Advisory Group following the Second World War; in 1954 organized and was the first commandant of the United States Army Command Management School at Fort Belvoir, Va., and served until his retirement from the service as a colonel July 31, 1958; writer and inventor; elected as a Democrat to the Eighty-sixth and Eighty-seventh Congresses January 3, 1959-January 3, 1963); was not a candidate for renomination in 1962 to the Eighty-eighth Congress, but was an unsuccessful candidate for the Democratic nomination for United States Senate; member of Subversive Activities Control Board, 1963-1966; died in Washington, D.C., October 11, 1974; interment in Arlington National Cemetery.